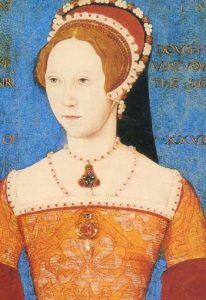 Citation: C N Trueman "Mary’s Coronation"
Mary I’s coronation on October 1st 1553 was a well-received event after the trials and tribulations of the attempt to place Lady Jane Grey on the throne. At the very start of her reign, Mary was a popular figure recognised by the people as the legitimate heir to Edward as she was the daughter of Henry VIII and Catherine of Aragon. The failure of Dudley’s attempt to place his daughter-in-law on the throne was very much to do with the fact that he completely misjudged the desire of the people to have a ‘proper’ Tudor on the throne. Therefore Mary’s coronation was viewed by many as a happy event, which was well celebrated by the people whom she now served. Two people had a very prominent place at the coronation procession held on September 30th – Mary’s half-sister Elizabeth and Anne of Cleves. How much Elizabeth was there simply because she was family is difficult to know. She was briefly incorrectly associated with disloyalty and was known to be a Protestant. One’s mother had been divorced to make way for the mother of the other. It is difficult to believe that there was a great deal of affection between Mary and Elizabeth, though in this era, the public display of such affection was rare even I it did exist as it was not the ‘done thing’ amongst royalty. Anne was there, so it is believed, as she was someone who had suffered the same public humiliation as Mary’s mother – divorce. Now Mary had the opportunity to make amends and to give a very public display of unity between the new queen and her former half-mother. In her coronation procession, Mary was driven through London in a carriage drawn by six horses. She wore a purple gown with ermine edges. A small “circlet of gold” was worn on her head and observers claim that it had so many valuable jewels in it that its value was inestimable and that she had to hold up her head with her hands, as the weight of the circlet was so great. Mary’s carriage was accompanied by knights, bishops, lords and immediately in front of her carriage was the Privy Council. Various senior nobles were in front of her carriage – The Lord Chancellor, the Earl of Oxford and Knights of the Bath. Immediately behind Mary’s carriage was another with Princess Elizabeth and Anne of Cleves in it. Behind this carriage rode a number of “gentlewomen”. All along the route of the coronation procession, pageants were performed, including ones by performers from Genoa and Florence. A writer described a conduit at Cornhill as “running with wine”. In the City the carriage containing Mary stopped and the Recorder of London read out a speech to her professing the loyalty of the people of London and he gave to Mary a gold thread purse that contained 1,000 gold coins. Near to St. Paul’s an oration was read out to her in English and Latin. From here Mary’s procession continued to Whitehall. On October 1st, Mary went by the Thames to the old Whitehall Palace. From here she went on foot to St. Peter’s Church where she was crowned and anointed by Stephen Gardner, the Bishop of Winchester. The whole coronation ceremony lasted until late afternoon.